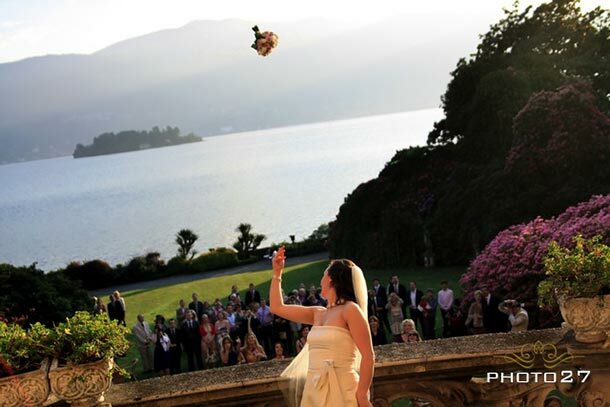 mong all wedding venues on Lake Maggiore, no doubt VILLA RUSCONI CLERICI in Verbania Pallanza is one of the most beautiful. You can breath a special vintage atmosphere here. The position is amazing, just on the lake shores facing Borromeo Islands and the English style garden is just breathtaking. 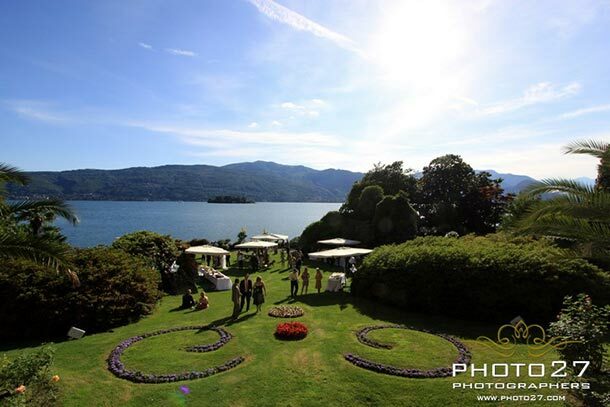 Thanks to this idyllic atmosphere, Villa Rusconi Clerici’s garden could be the ideal set for romantic ceremonies on the Lake shores. 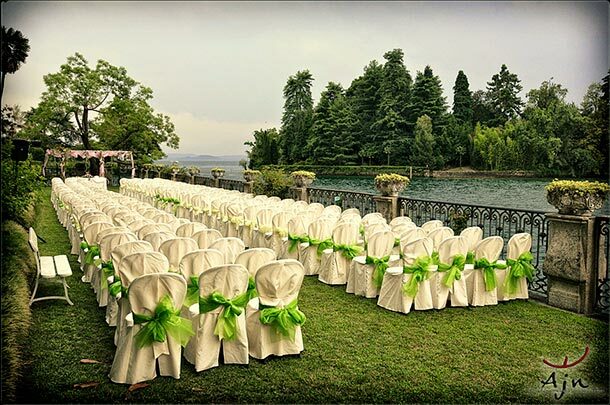 You could tie the knot just on this wonderful green garden. 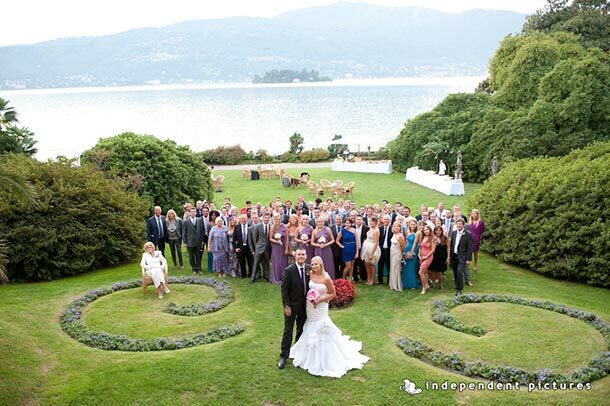 Group photo in the big lawn of the villa. 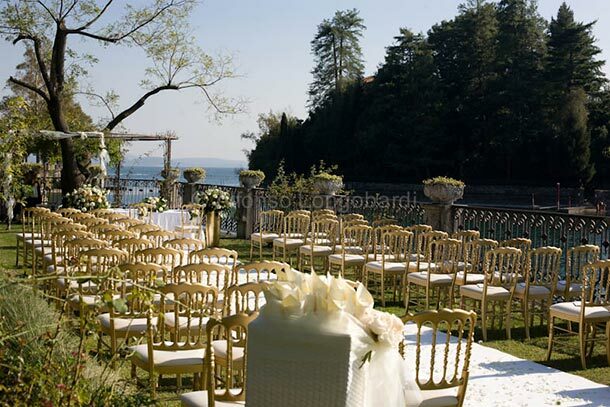 For the ceremony in the garden we start from the arrangements for bride and groom’s chairs and ceremony table. You could also add two floral composition on the side of the table. 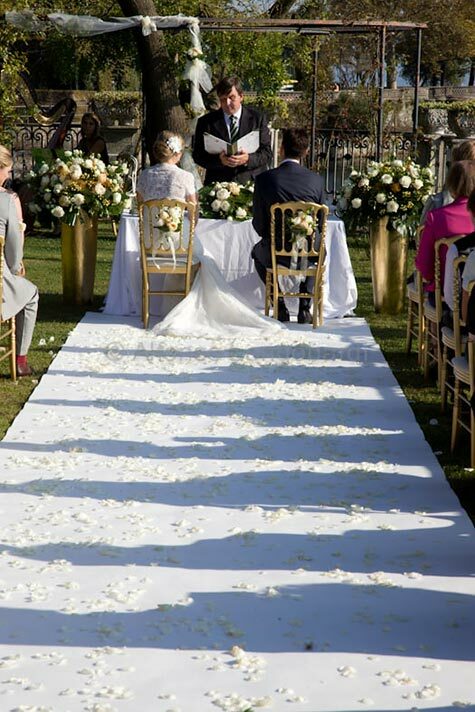 A nice idea could be using a lot of rose petals to scatter on the aisle and side of bride and groom. 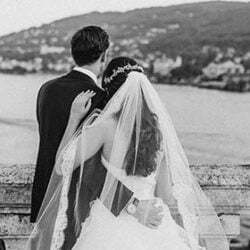 As wedding planner I organized many weddings at Villa Rusconi Clerici and in this post you can see some of the most beautiful that I will always remember. 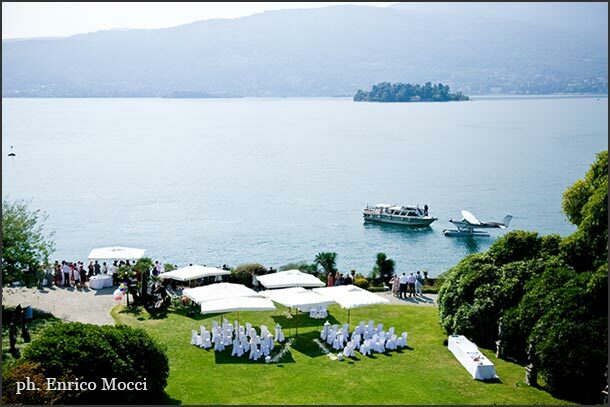 Wonderful days on this special venue on Lake Maggiore. 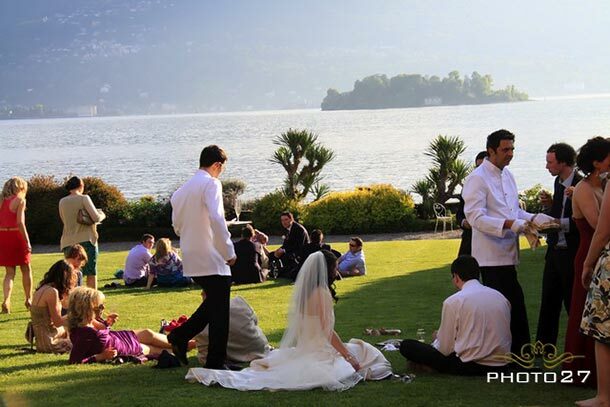 The lawn is also the perfect set for your welcome cocktail or for a rich aperitif after the ceremony. 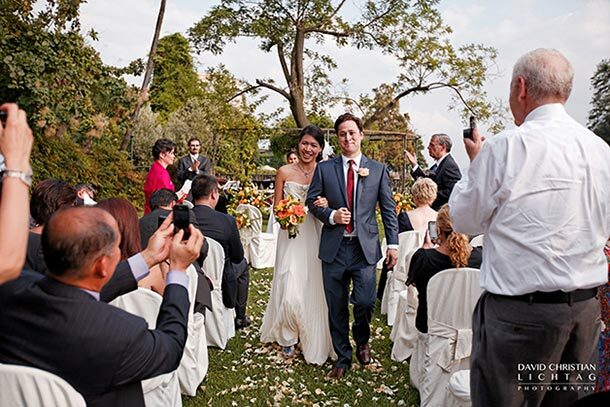 Reception is usually planned side of the lawn in the wide pavilion that reminds about the old fashioned winter gardens of 1800. Wonderful view! 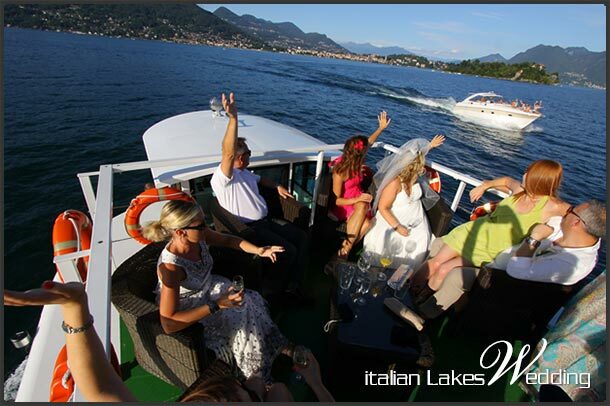 A rare shot taken from the bridal boat reaching Villa Rusconi. Blue hour on Lake. Pallanza village as backdrop. Photo by Independent Pictures. Cutting of the big wedding cake! 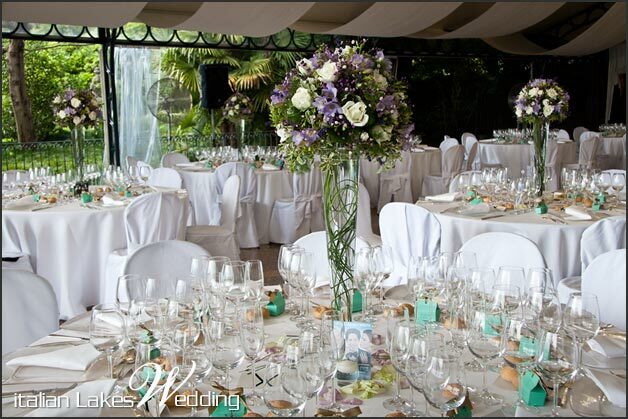 A blue themed wedding for Caroline and Tony. 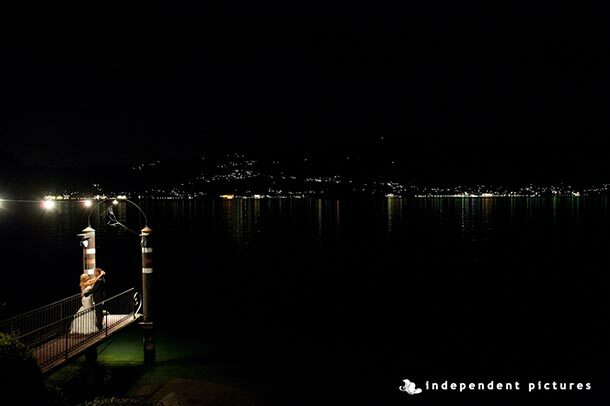 At night with the lake as backdrop. Photo by Independent Pictures. 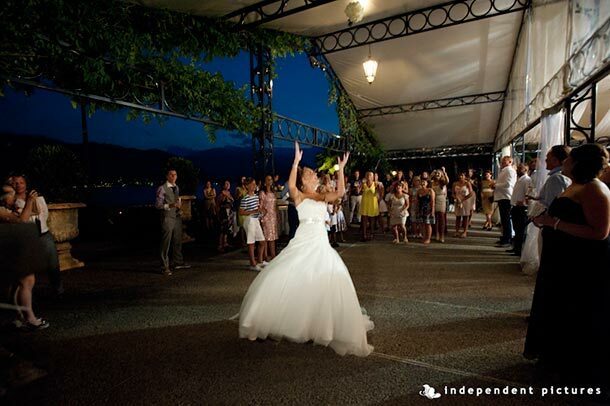 Throwing of the bouquet in the pavilion after the cutting of the wedding cake. And dances to follow. 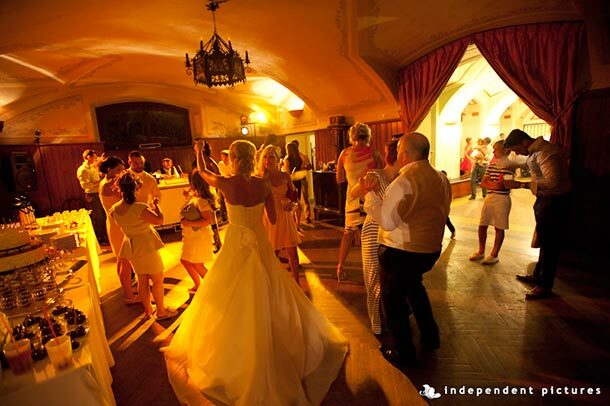 Sweet buffet in the cellar and dances after the wedding reception. 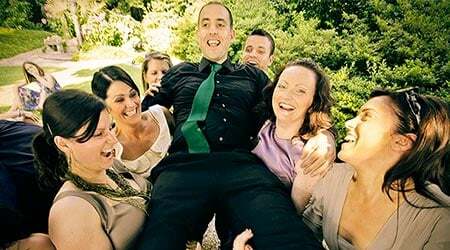 A little curiosity: the groom – a professional DJ – was djing in that moment! Photo by Independent Pictures. 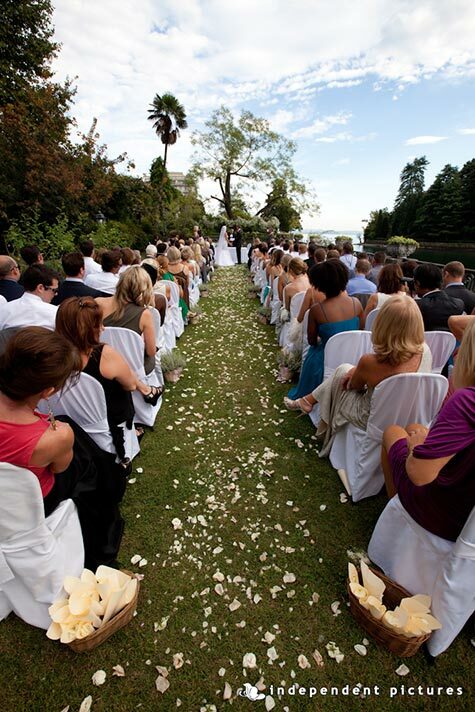 Ready for the wedding ceremony in the garden by the shores. A big event of 240 guests with special pink and green decorations. – photo by Ajn – Luca Rajna. 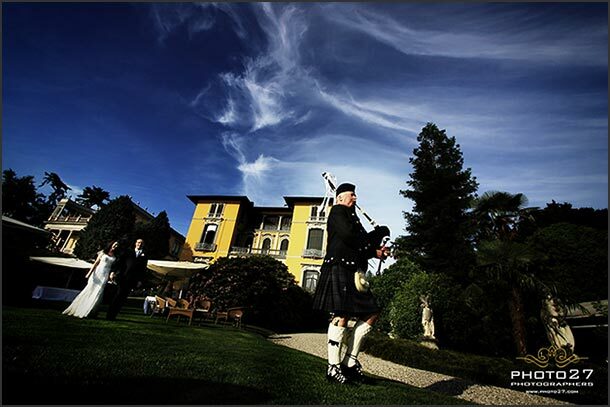 A wonderful setting for Nikki and Adrian’s blessing in the gardens of the villa. 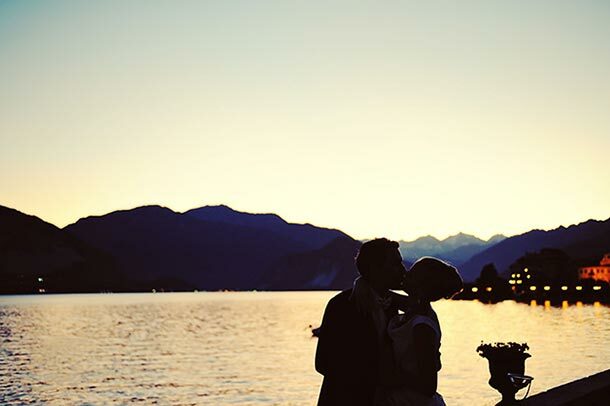 Golden themed wedding ceremony. 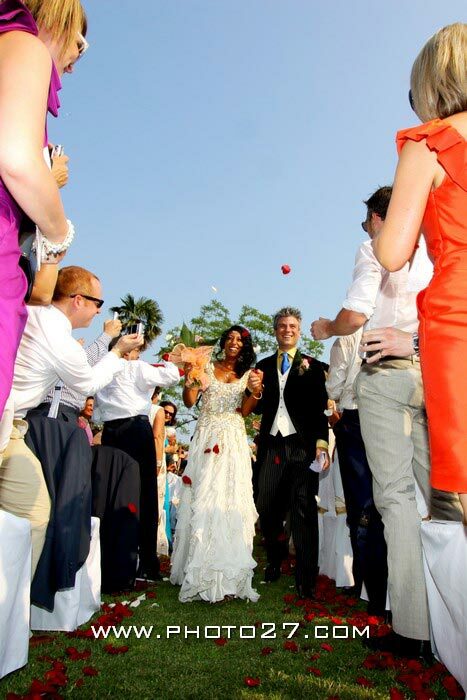 Blessing of bride and groom. 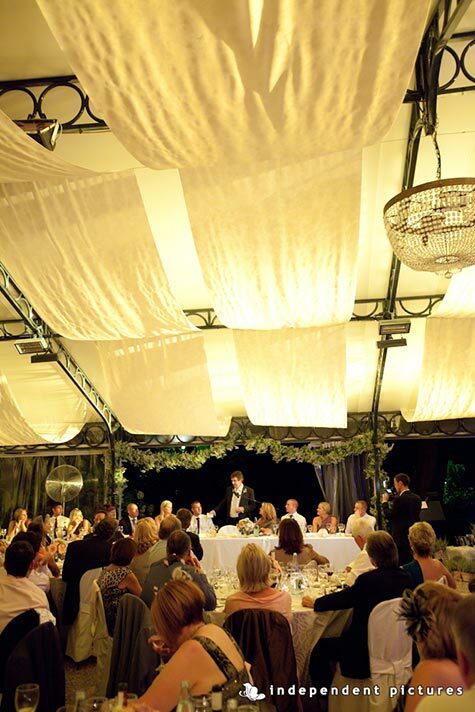 Another nice idea could be placing the table of the ceremony side of the iron gazebo, just on the side of the garden in front of Isolotto San Giovanni. (St. John small Island). 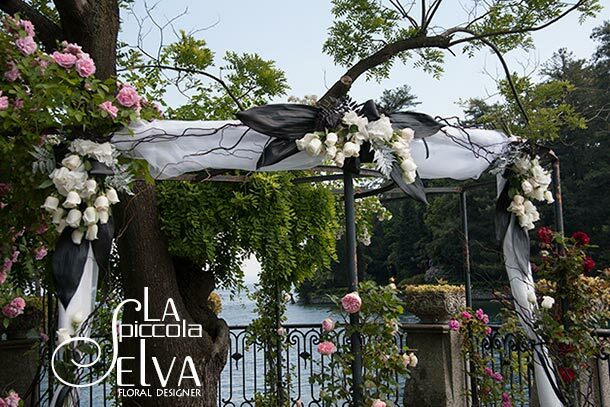 Gazebo can be embellished with fabrics, organza and flowers falling on the structure. 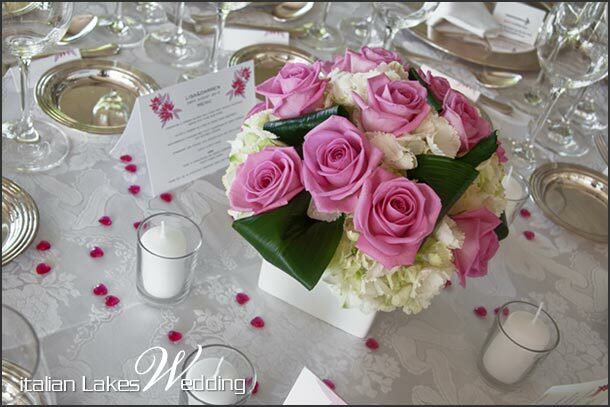 But just some little touches, all should seem as natural as possible in such a wonderful venue. During the aperitif little composition could embellish the little cocktail tables, while bigger compositions could be placed side of the buffet table arranged by the catering company, just side of fresh prosecco, finger food and little canapés. As far as the centerpieces for the reception are concerned you have a lot of options. 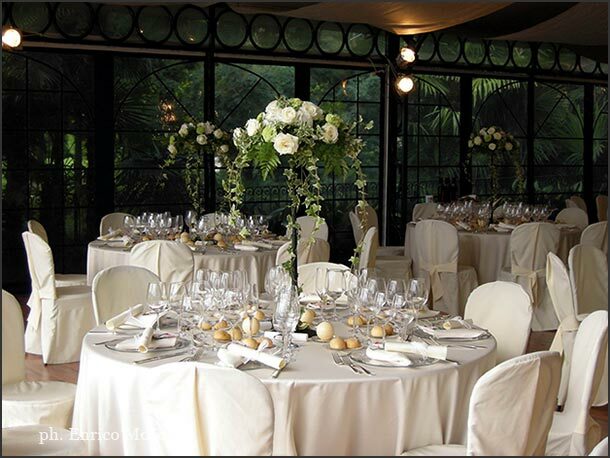 Villa Rusconi Clerici pavilion is quite wine and I suggest to opt for big centerpieces. 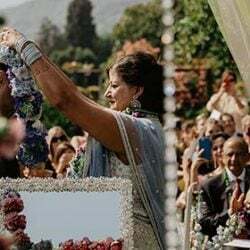 You could arrange them according the mise and place you will choose with the catering company but of course you could opt for traditional, country-syle, modern, tall or simple ones. 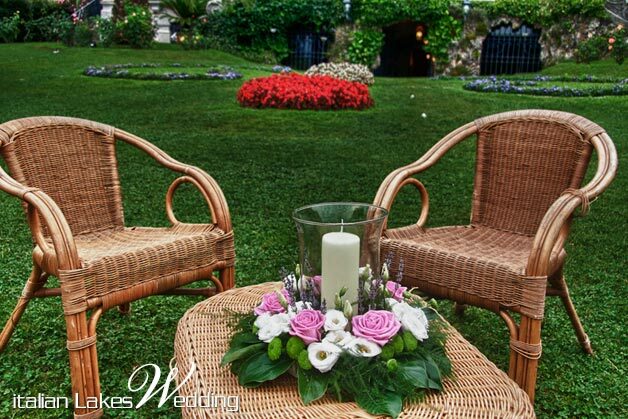 A little suggestion for your centerpiece at Villa Rusconi: using tall composition just like this with dropping ivy, fern and roses. 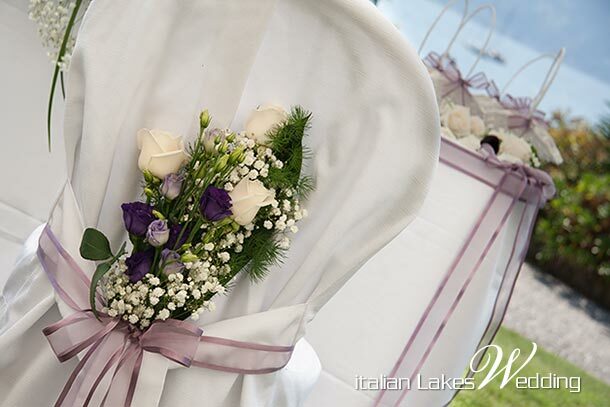 Mise en place for Loretta and Scott’s wedding – again a tall centerpiece on a thin and tall vase. 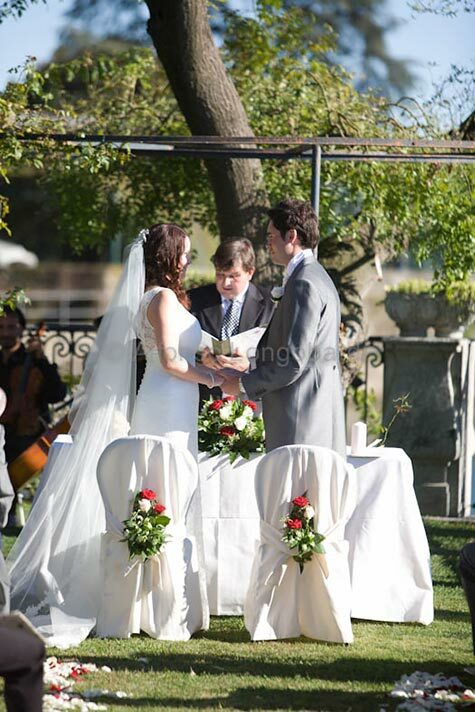 A classical centerpiece could be fine and elegant too, just like Lisa and Darren chose. Reception in the wonderful pavilion with special light set. 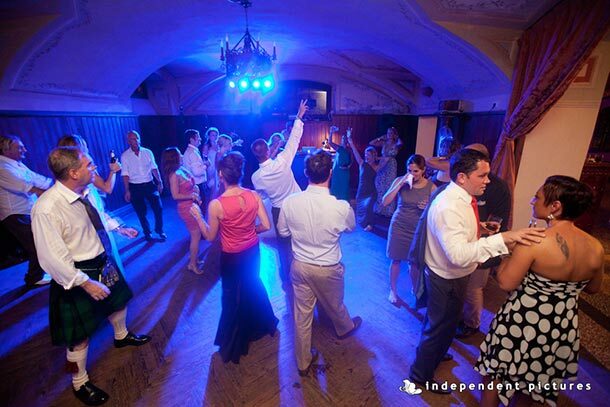 Dances and party in the cellar after the reception. Lot of fun for everybody! 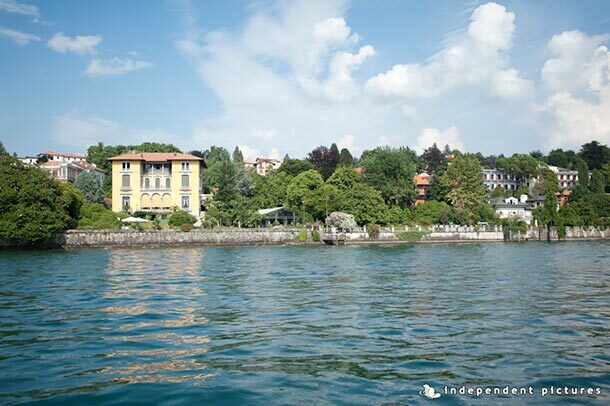 You can reach Villa Rusconi by car or motorboat but even on a…. plane! Just like Judith and Mark. 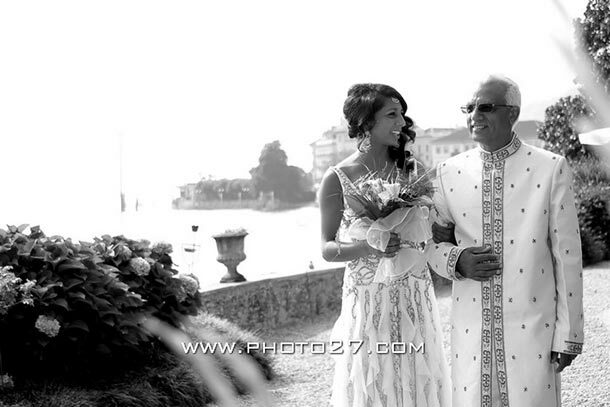 After the ceremony photo session for the bride and groom on the private jetty of the villa. 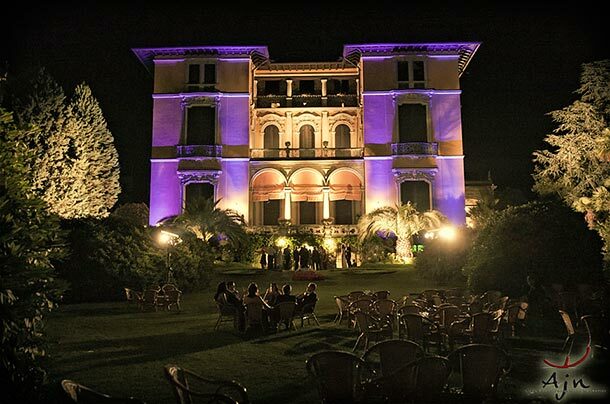 I hope that all ideas and pictures in this post could inspire you for your wedding at Villa Rusconi Clerici. 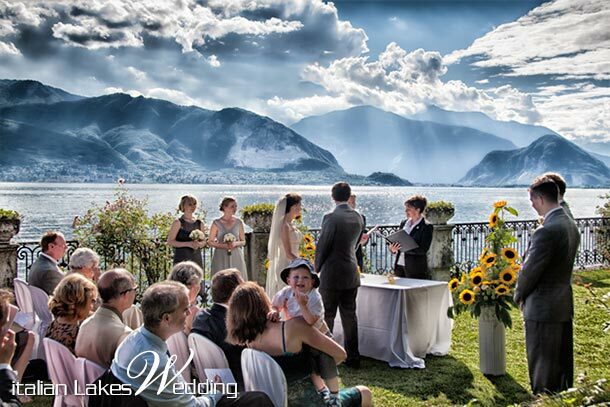 They all come from my long experience as wedding planner at this wonderful venue on Lake Maggiore. 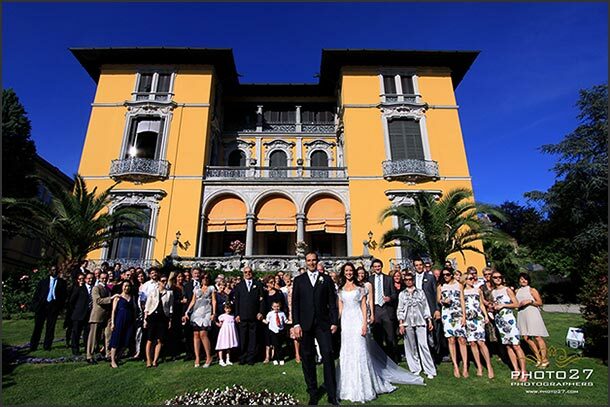 For further information for your wedding at Villa Rusconi Clerici in Pallanza just fill the form below.